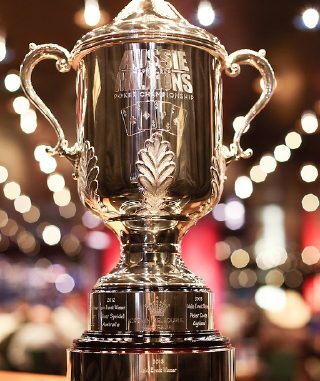 The final table has been decided for the 2013 Aussie Millions Main Event with a pair of Aussies still in contention to make it five in-a-row for the host nation. 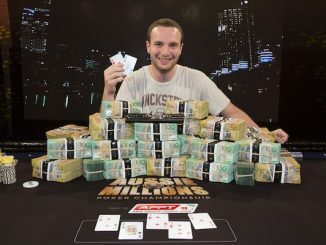 Melbourne-based duo Jarrod Glennon and Joe Cabret enter the final stage in the battle for the $1.6 million first prize lying second and fifth in chips respectively. Glennon, whose previous best live tournament cash was a modest $4710 for eighth in last year’s Poker Zone Cup Main Event in Adelaide, is just a handful of chips behind leader and past $100,000 Hold’em Challenge winner Dan Shak. Runner-up in last year’s $250,000 buy-in event at the Aussie Millions, Patrik Antonius is assured his third Main Event cash having finished in the money in 2007 and 2009. He’s third in chips and the popular pick of most to go all the way. Malaysia’s Mervin Chan collected $3500 for finishing 65th in the 2013 Opening Event, his first and only tournament cash to date. He’s already assured at least $150,000 but sitting fourth in chips, his aspirations will be for a much larger payday. Joe Cabret joins an elite list of players who’ve reached more than one Aussie Millions Main Event final tables after finishing fifth in 2003. A constant on the local scene for more than two decades, he’ll be guaranteed plenty of hometown support today. Auckland’s David Yan will be hoping to join Jamil Dia and Lee Nelson as Main Event winners from New Zealand while Jenny “Jay” Tan will be out to become the highest placed female player in Main Event history, surpassing the seventh-placed finishes of Kristy Gazes (2007) and Annette Obrestad (2010). Day four started with 36 players remaining and WA’s Ray Ellis holding a narrow chip lead. 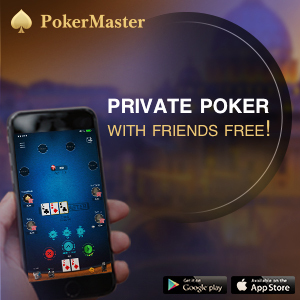 Adelaide’s Stevan Chew was first out in 36th while Phil Ivey’s tournament came to an when James Obst’s pocket sevens prevailed over pocket sixes and an open-ended straight draw for Ivey. Kenny Wong’s hopes of back-to-back Main Event final tables ended in 28th while Celina Lin celebrated her best ever finish in her former hometown, placing 24th. James Obst’s gallant charge ended in 19th after he ran pocket sixes into the pocket eights of Mervin Chan after a flop of 7-7-7. Ray Ellis carried his stack all the way to 13th while Daniel Laidlaw was railed in dramatic circumstances when Shak landed a two-outer to pair his A-7 against Laidlaw’s A-K.
More than two hours passed before local player Mark Betts bowed out in ninth, then Sam Cohen’s tournament ended after she watched Shak turn over a higher straight on a board of 8-J-10-9-8.